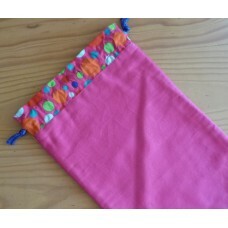 For that little girl that loves pink, this drawstring bag is the perfect size to hold all those little treasures. Use as part of a gift or as eco friendly reusable wrapping. Made in Australia these small bags come in a variety of colours and patterns. Fully lined and has double drawstring string for easy use, this hot pink bag with contrasting multi spots is well constructed. Lining Colour: Orange. 100% cotton. Army Camo Extra Small Drawstring Bag is perfect for storing tiny toys, treasures or itty bitty books.. This drawstring bag is purple with a multi stripe top. It has been fully lined and has double .. Perfect little drawstring bag to store small toys in. This hot pink bag has a multi stripe top..
Black and Red Check drawstring bag is well constructed and durable, with double drawstrings which ma.. Extra Small Drawstring Bag - Mauve Flower design has double drawstrings and is fully lined with a co.. This boy's drawstring bag is perfect for storing toys, blocks, cars or books. Featuring an army camo..